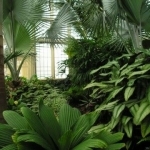 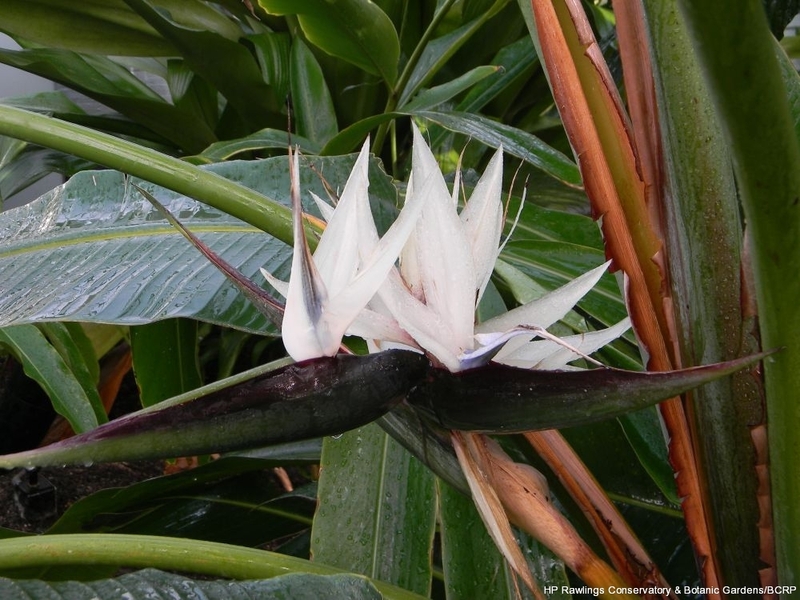 Tropical plants require a climate around 72 degrees, with 80 percent humidity and frequent rain. 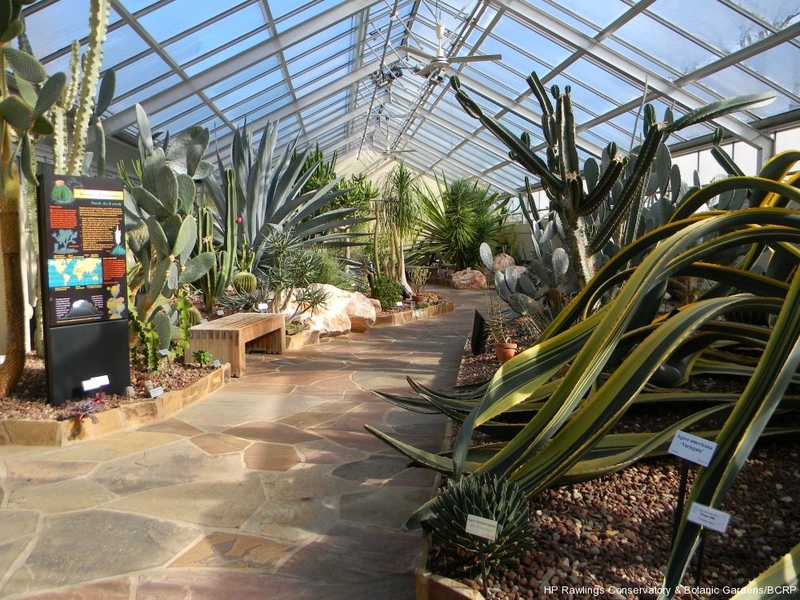 Desert plants require 90-plus degrees, 20-30 percent humidity, and little rainfall. 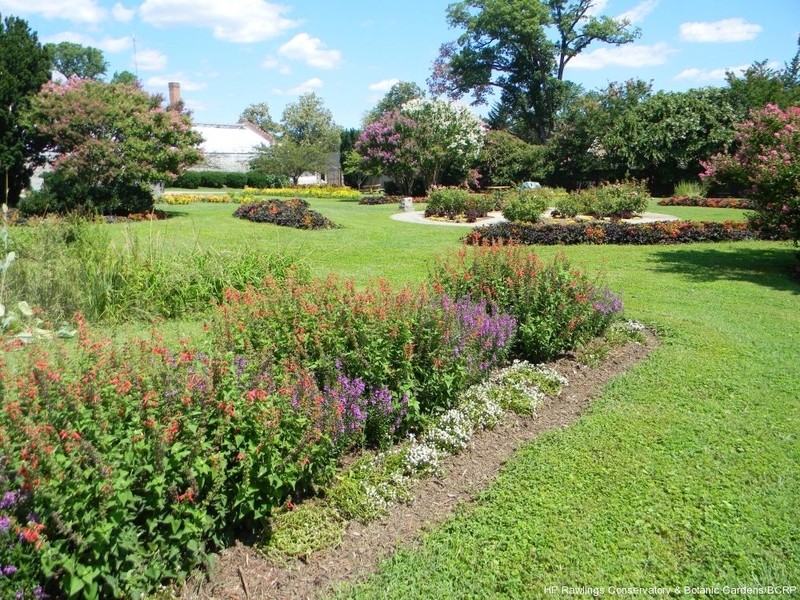 These climates differ greatly from that of Maryland with its cold winters, hot summers, and 42 inches of annual rainfall. 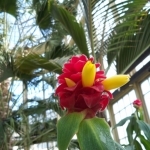 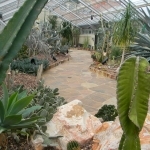 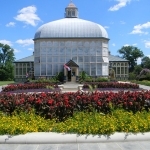 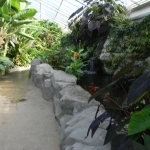 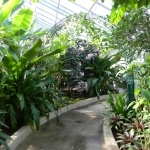 The Conservatory thus provides an efficient tour of the world’s flora (from China to Africa, from the South American rainforests to the world’s deserts) where visitors of any age and any level of horticultural interest and expertise may study the plants in their natural environments. 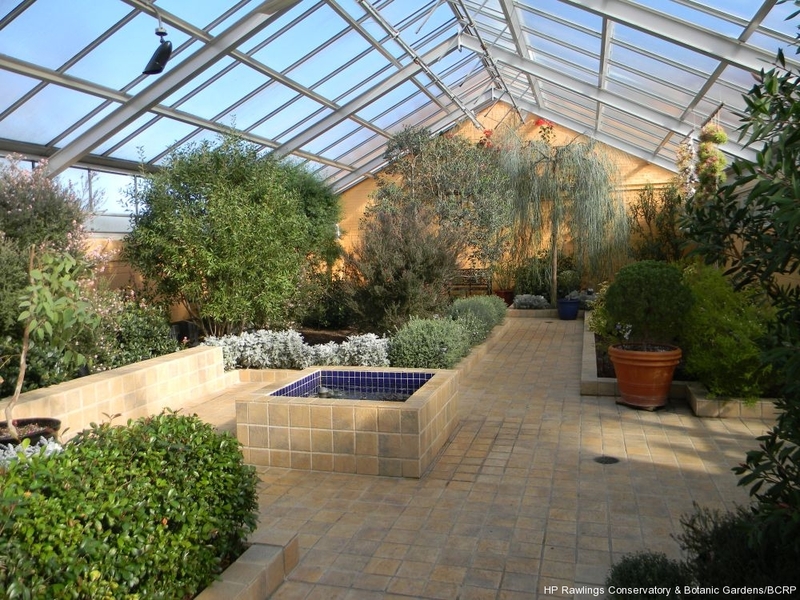 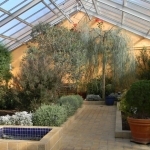 The mild Mediterranean greenhouse replicates the dry summers and foggy winters of the Mediterranean basin and southern California. 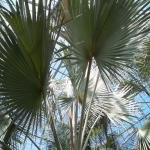 This climate results from prevailing westerly winds blowing inland from the sea. 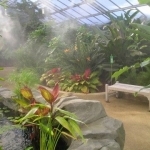 In the summer, when the land is warmer than the water, the moisture in the air immediately evaporates, creating a warm, dry season. 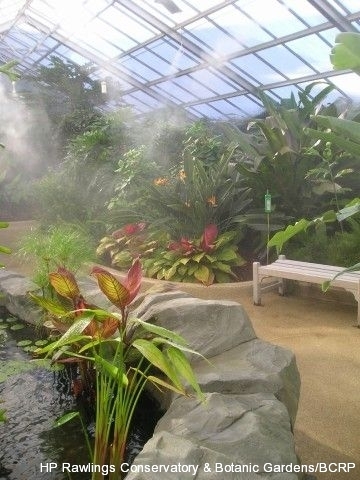 Alternatively, when the water is warmer than the land in the winter, the effect is of a wet, often foggy, season with mild temperatures. 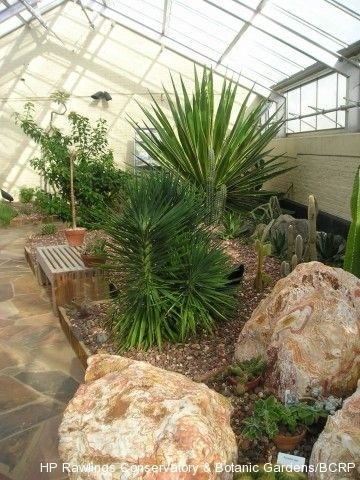 Plants of the Mediterranean, such as rosemary, bay trees, and geraniums, have been introduced throughout the world. 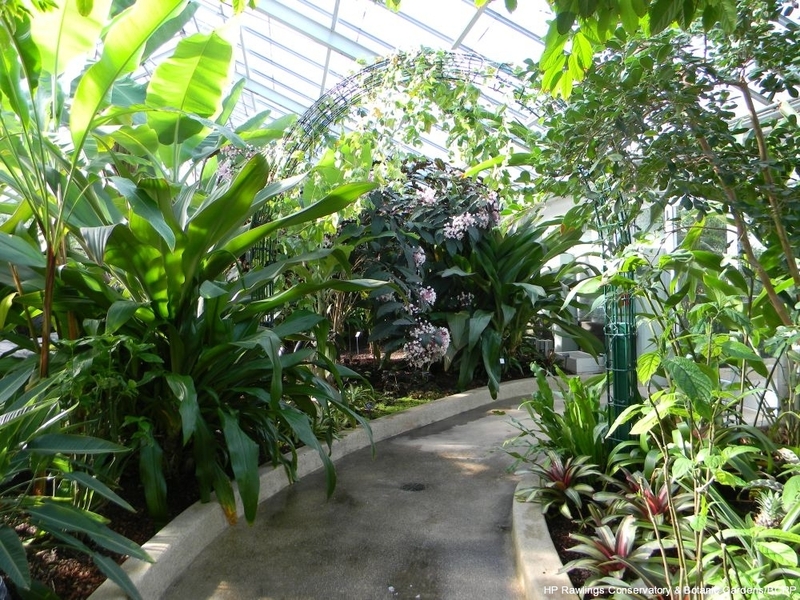 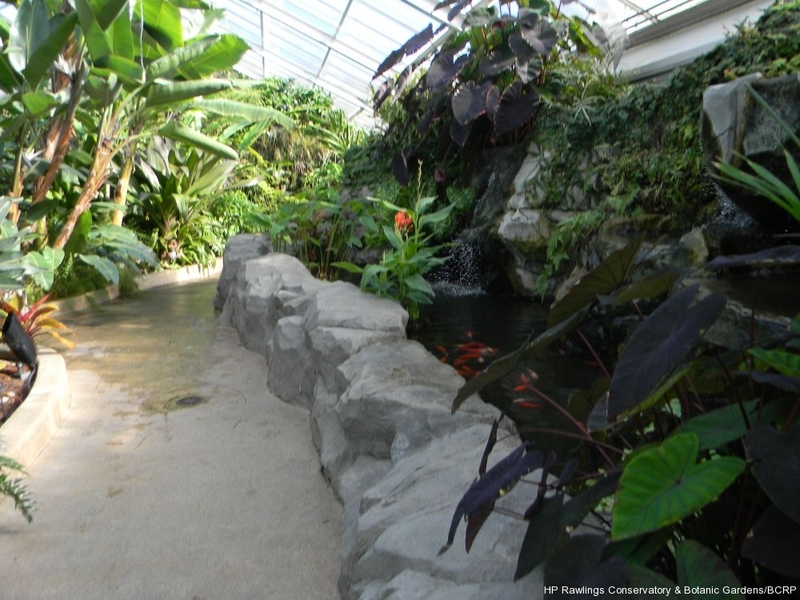 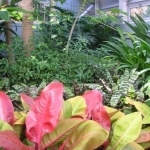 The Tropical Forest greenhouse displays the plants that originate in the tropics — the areas located between 30 degrees north and 30 degrees south of the equator. 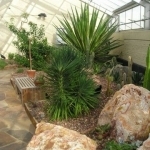 Plants on display include those native to parts of Africa, Asia, the Americas, Australia, and some tropical islands. 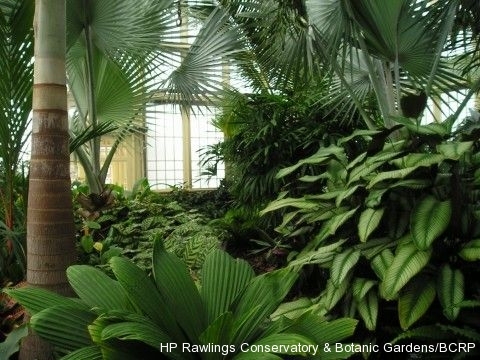 This amazing variety of flora requires abundant rain, high humidity, and consistently warm temperatures. 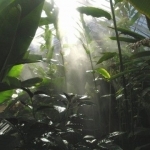 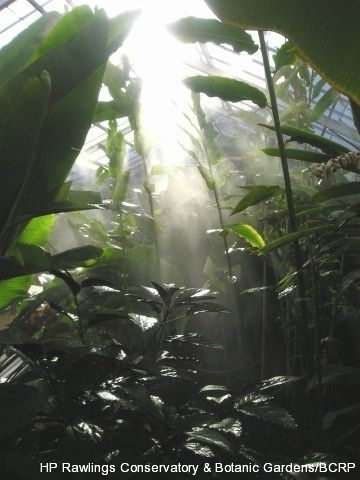 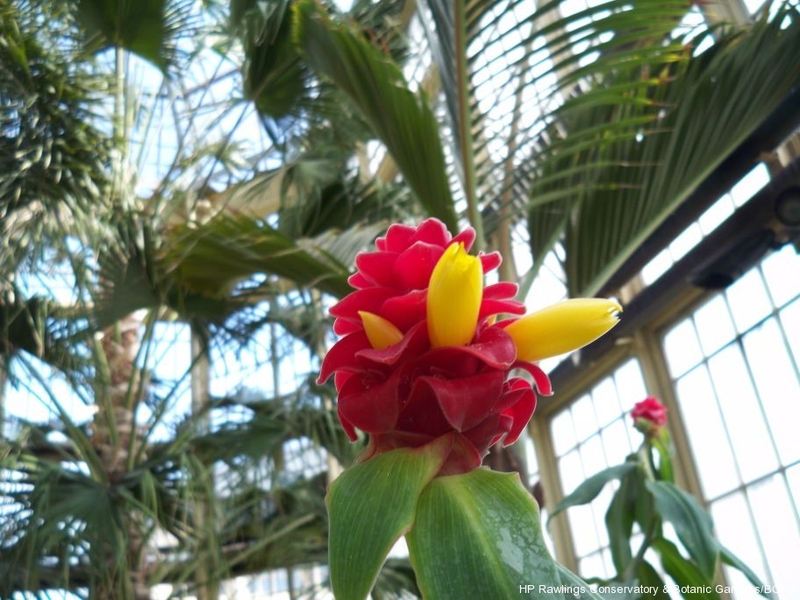 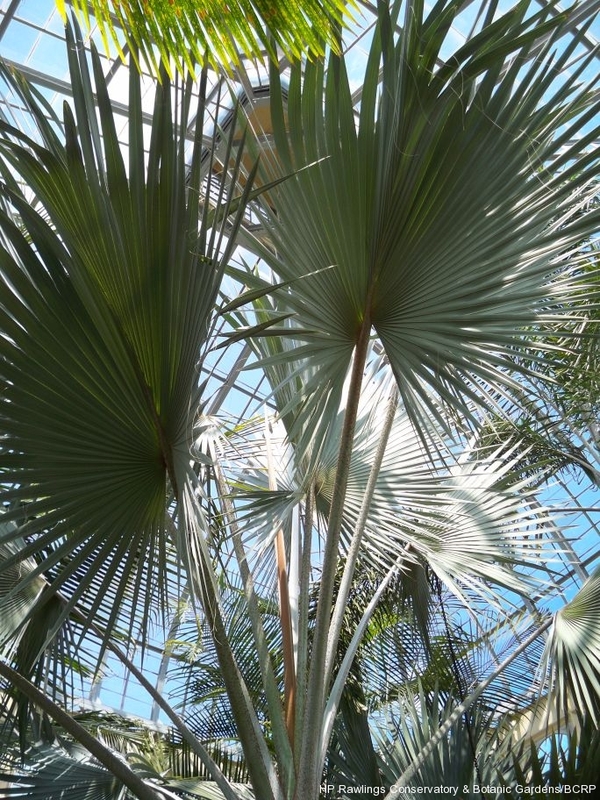 Tropical plants receive 12 hours of light per day and direct, intensely hot light from the sun. 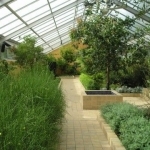 The year-round growing seasons encourage very tall trees with dense canopies that greatly limit the sunlight available to the plants below. 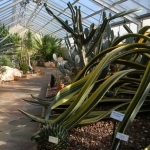 To survive, the plants underneath have adapted in various ways. 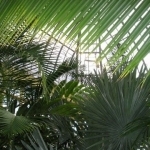 Some grow very large leaves to capture as much available light as possible. 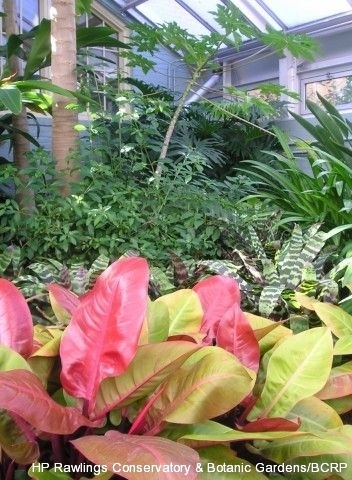 Vining plants grow closer to the light by climbing the tree trunks. 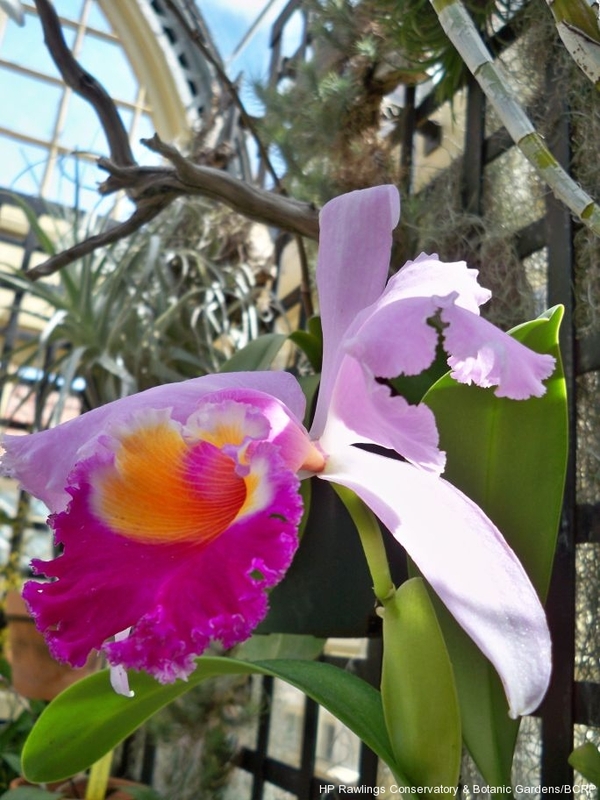 Epiphytes, such as many orchids and bromeliads, live up in the trees and grow aerial roots that attach to the surface of the tree branches. 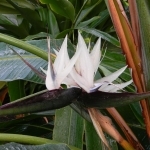 These aerial roots, contrary to popular belief, are not usually parasitic, but allow the epiphytes to capture rainwater filled with nutrient-rich organic debris before it can trickle down to the plants below on the forest floor. 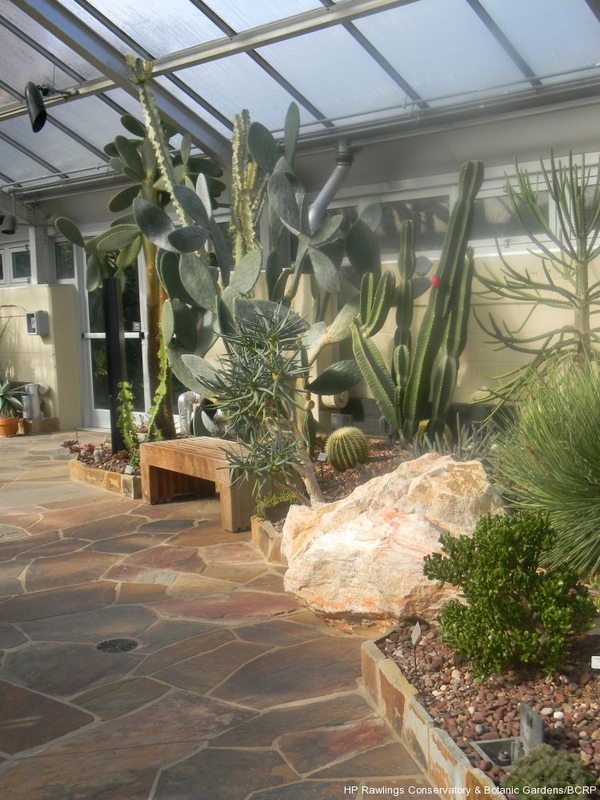 The Desert greenhouse showcases plants that can endure the harsh, windy, and arid conditions of the desert where daytime temperatures can climb as high as 125 degrees Fahrenheit and fall as low as 10 degrees at night. 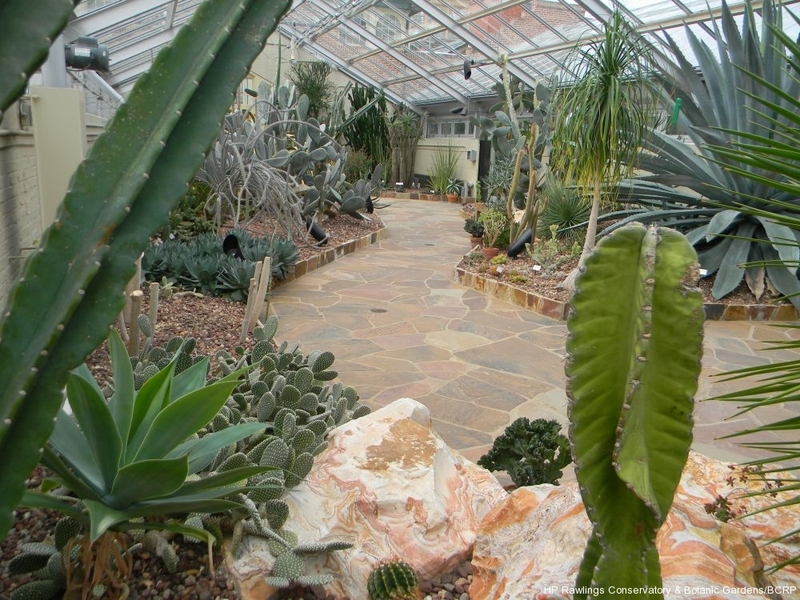 With little or no rainfall—often 10 inches or less a year—true deserts have plant coverage of 10 percent or less. 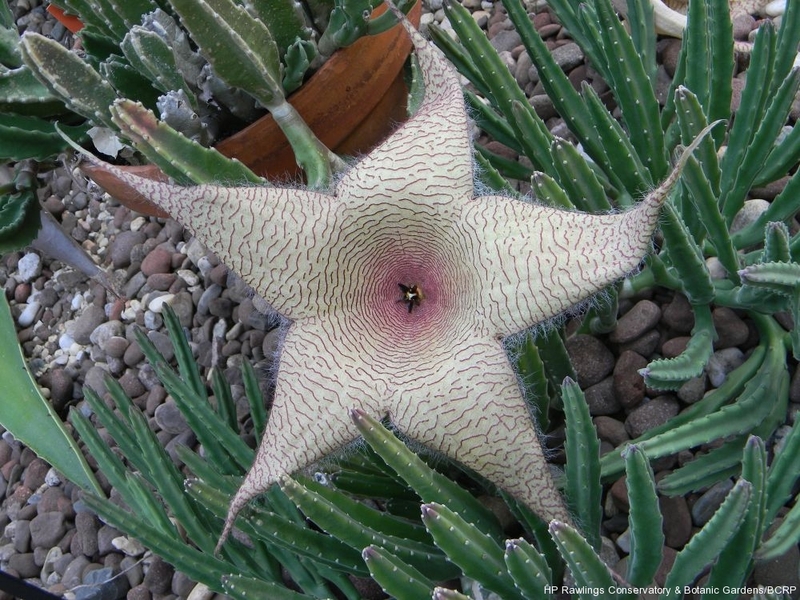 Desert plants must make special adaptations in order to survive. 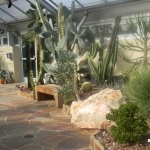 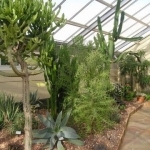 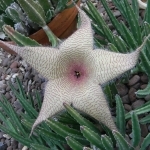 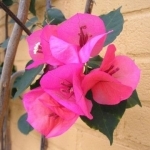 Desert plants include: annuals such as wildflowers that sprout when it rains; century plants which only grow when it rains; water-storing succulents such as cacti and sansevieria; and, small shrubs such as yuccas, Joshua trees, and creosote. 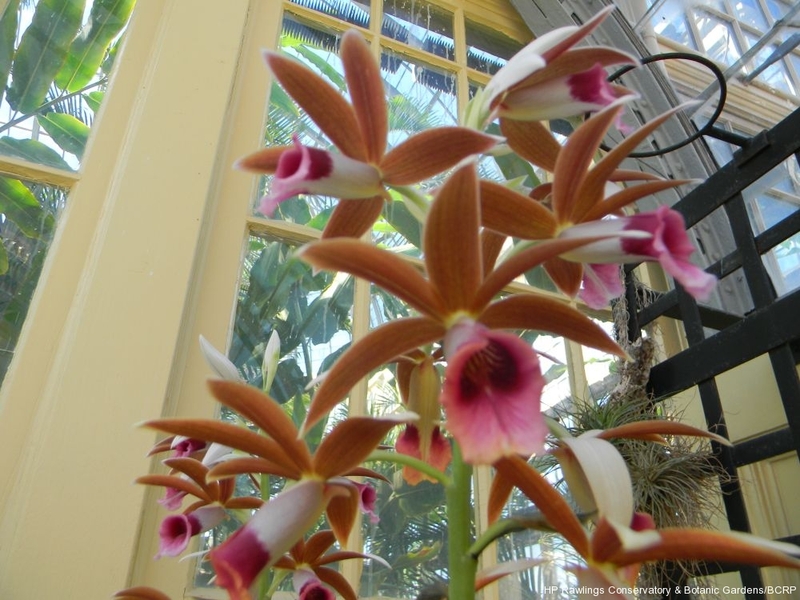 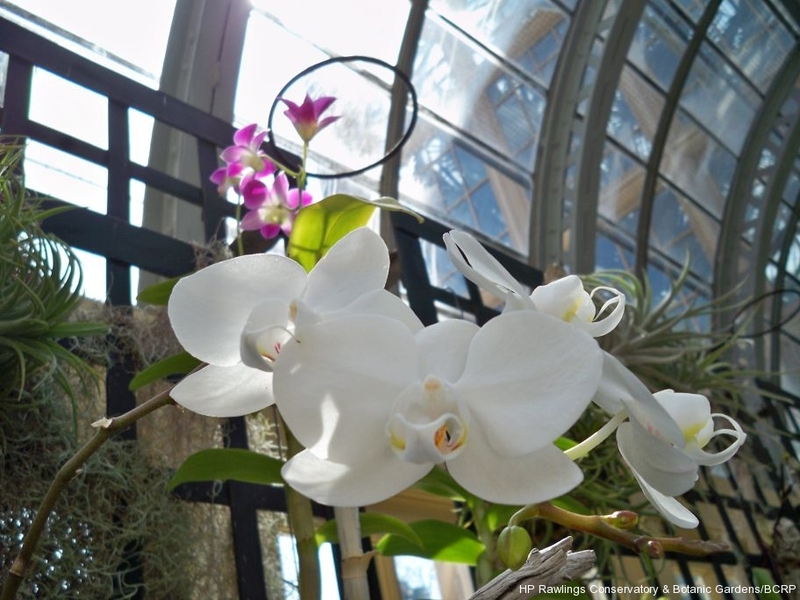 The Orchid Room features the largest of all the plant groups, which includes over 30,000 species of orchids and more than 100,000 registered hybrids. 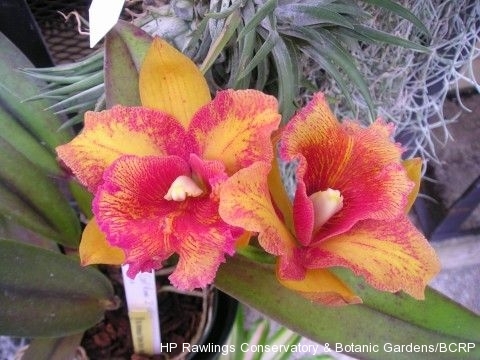 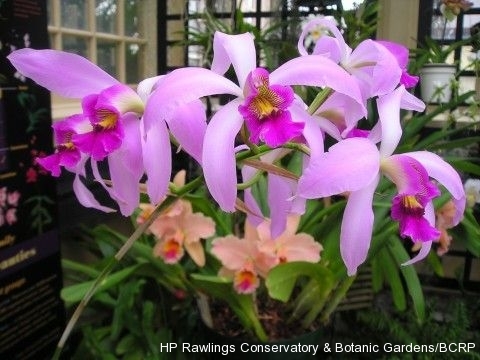 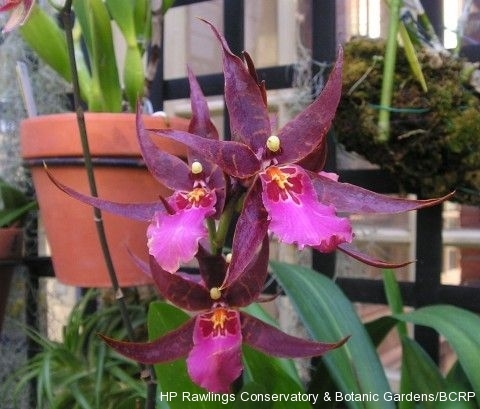 One in 10 of the earth’s plant species is an orchid. 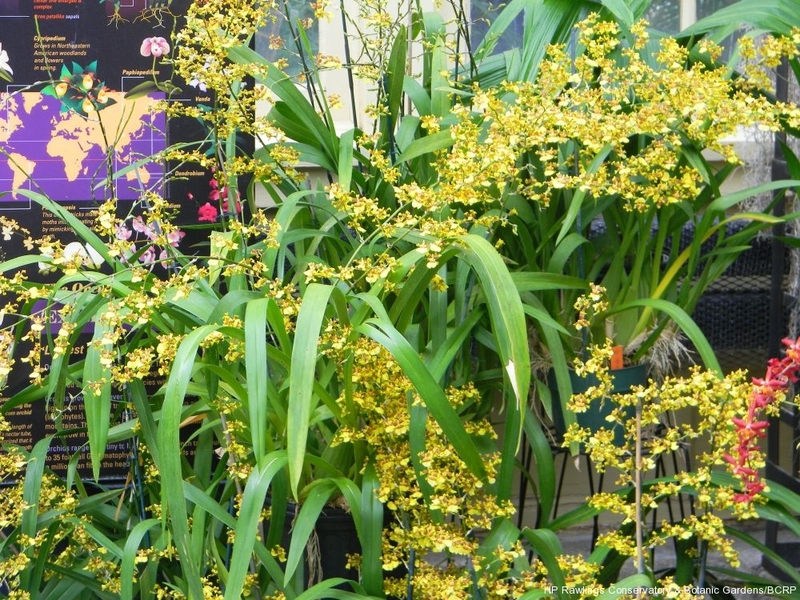 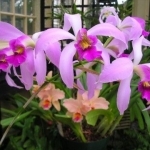 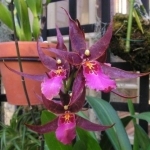 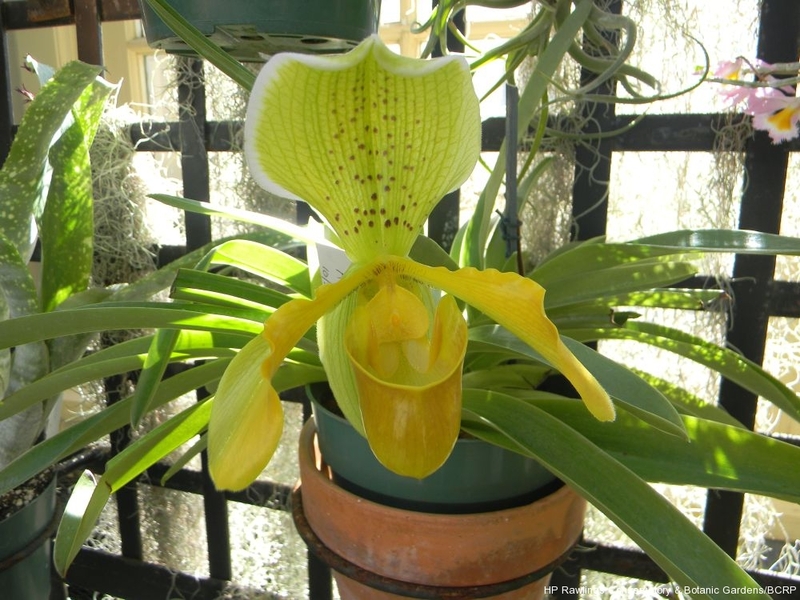 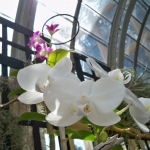 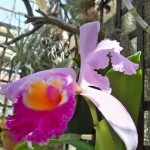 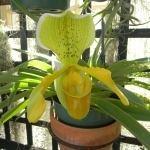 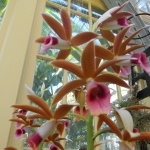 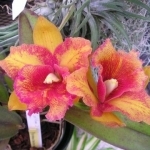 The orchids on display are selected to showcase a representative range of varieties and are usually displayed only during their blooming period. 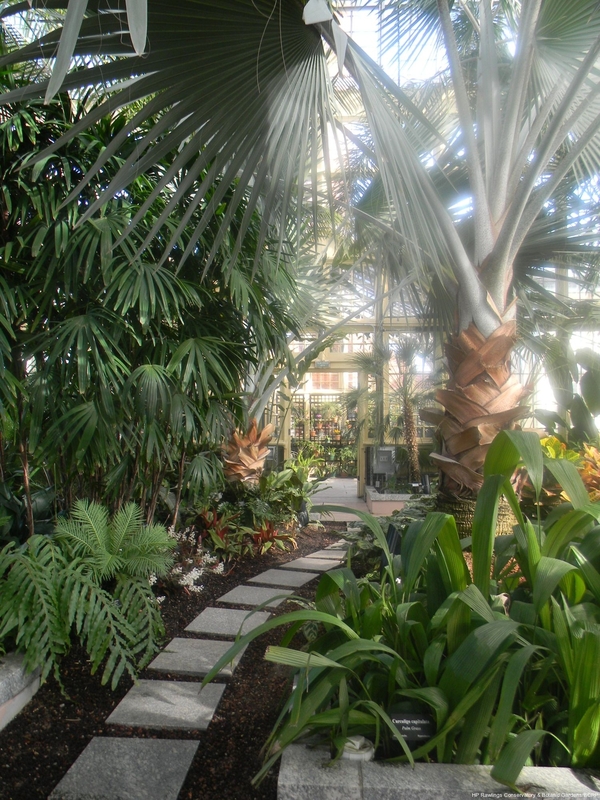 The Palm House grants the visitor an opportunity to return to the Victorian era, the period named for Queen Victoria, an English monarch who ruled from 1837-1901. 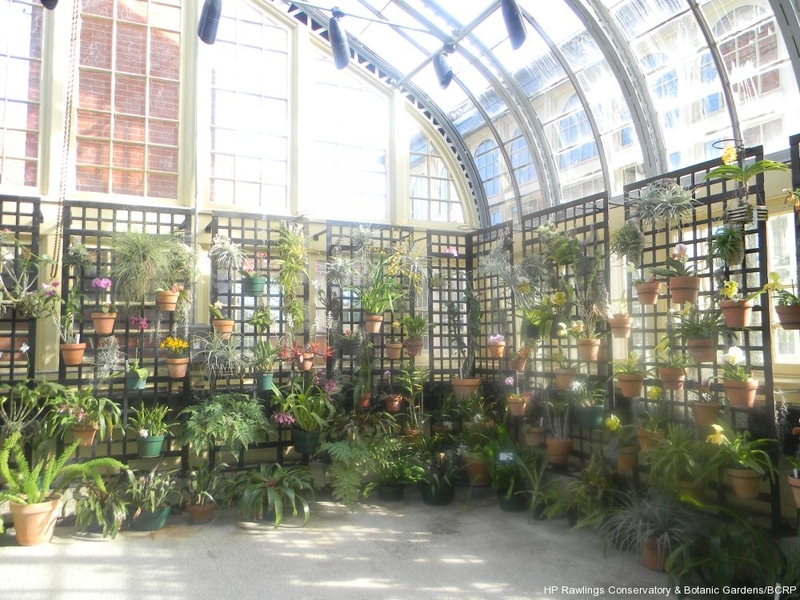 Victorians intensely pursued engineering, exploring and collecting. 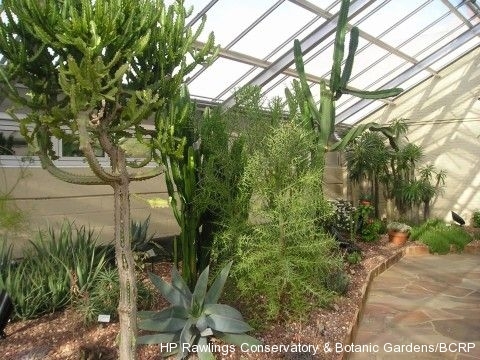 These fascinations culminated in the construction of great iron, glass, and wooden buildings to showcase plants collected from worldwide expeditions. 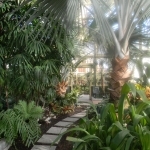 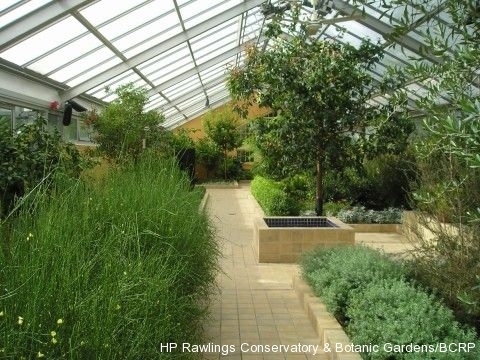 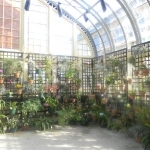 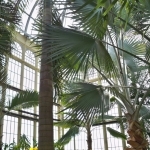 Though most Victorian parlors included plants, most homes could not accommodate the larger species, thus the popularity of the public conservatories for exhibiting palms and other large plants that require a tropical environment. 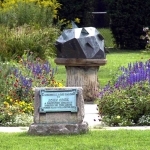 The Sundial in the Garden is an unusual, multi-faceted sundial created by Peter Hamilton of Guilford and Waltersville Granite Company and was presented to the City of Baltimore around 1890. 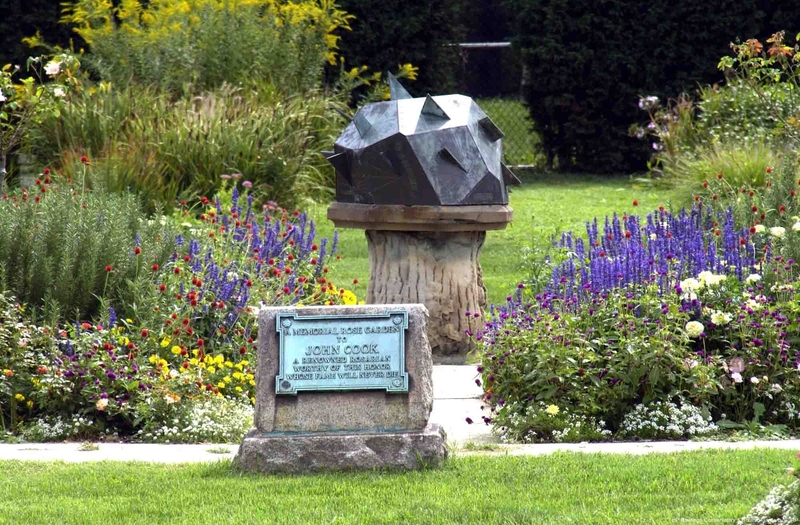 It was originally crafted out of granite but has since been covered in bronze. 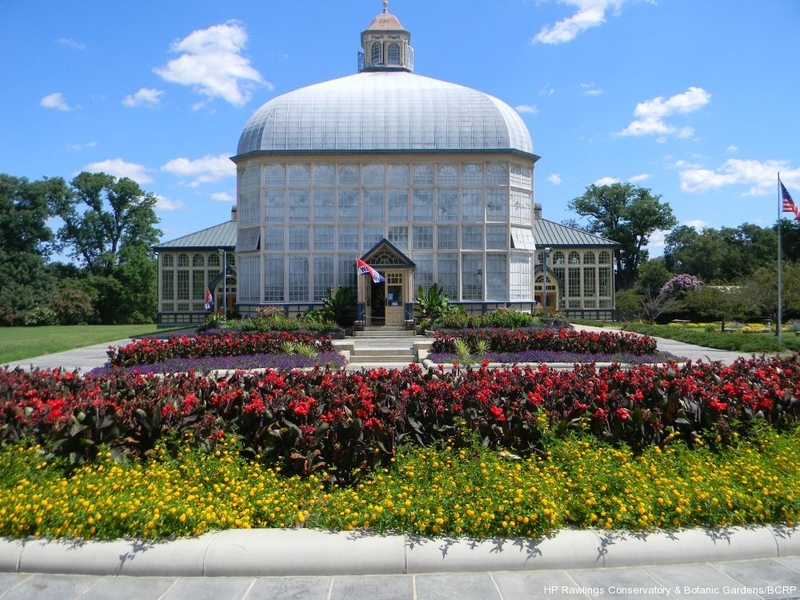 The sundial records the times for Baltimore, Cape Cod, Rio de Janeiro, San Francisco, Pitcairn Island, Sitka, Honolulu, Jeddo (Tokyo), Calcutta, Cape Town, Jerusalem, Fernando Po, and London. 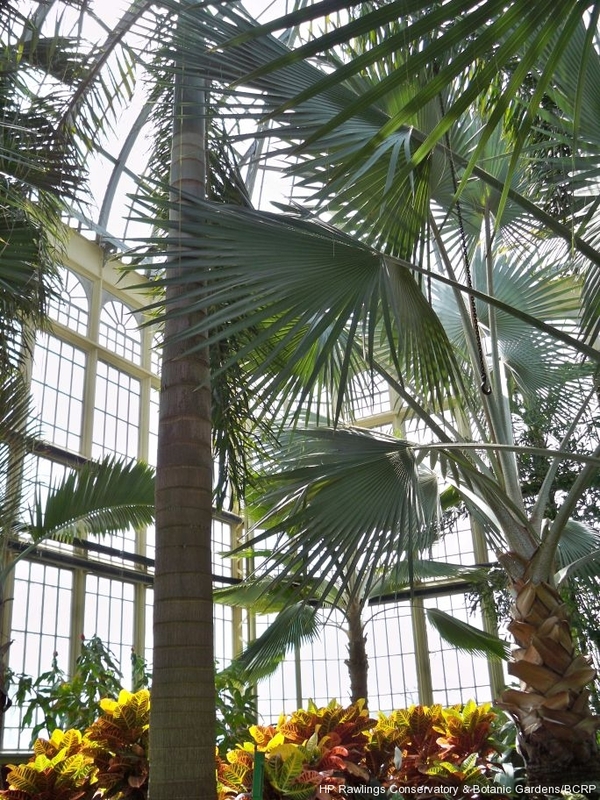 The time recorded on the dial is not in sync with today’s clocks. 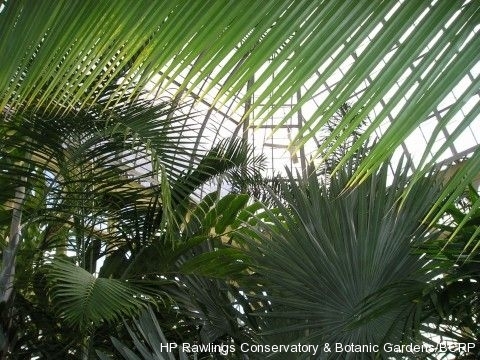 Before standard time was enacted in 1884, people used solar time. 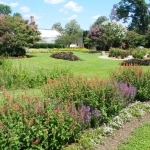 This meant that noon on Cape Cod arrived earlier than noon in Baltimore. 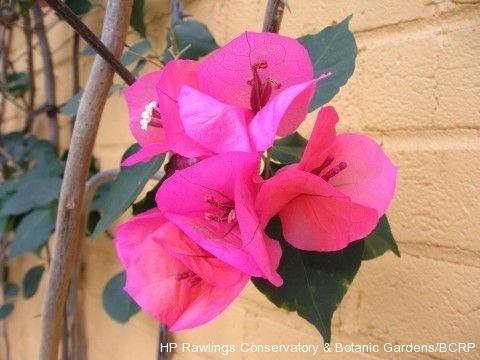 Today, especially during daylight savings time, the dial can be off by as much as an hour and 45 minutes.